You can get all background images and other images, you are using on multiple pages, on your website get optimized in two clicks. You will find it at your desktop. Image optimization is very important for your page loading time and speed of your site. It saves valuable bandwidth also and enhance user experience. There are few good tools out there which do wonders for those who do not know much of image editing. DynamicDrive's image optimizer is one good tool, which will give you differently optimized images of a single image you provide. You can give url of the online image or upload it from your computer. 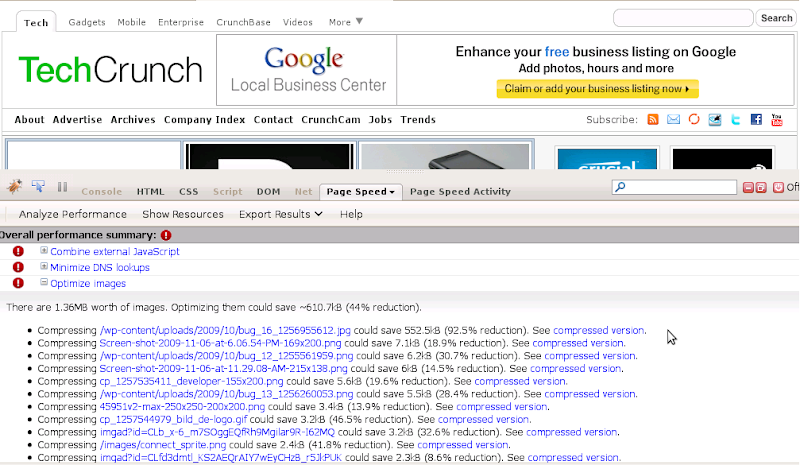 Google's website performance enhancement tool page-speed will give you a single well optimized image. This tool will give you all optimized images on a page at one go. This is important. Thats what I want to tell you. If you already have not installed page-speed on your PC then you need to follow one extra step of installing it. As always, you may have expected that it is simple to use. Page-Speed is based on Firebug tool. For Yslow also, you need Firebug installed on your PC. I think you may have that on your Firefox browser. Check another article on Page-speed here. Just mouse hover on compress version on your browser and you will see your optimized image. To save it on your computer, just follow the link, which says - 'compressed version'. I have used Tech Crunch and not my site as I am not using many images on my blog.